For a little over a month now, I’ve been looking at my AdSense earnings in Google Analytics to better understand my earnings, and I’ve stumbled across some rather interesting results. Without even realising it, I’ve come up with even more ways to increase my AdSense earnings each month. They range from simple ad placement, to writing specific posts, and appealing to a certain referrer. Here’s how you can increase YOUR earnings. The first thing you’ll want to do is set up your AdSense so that you can study it in more detail, in Analytics. To do this, when you’re viewing your report overview, just click the link to integrate Adsense with your Analytics account. It’s just one click and then a small amount of information on your Analytics account. You have to be an admin on your Analytics account, otherwise it won’t let you make the changes necessary, but if you’re the only person running the website, this shouldn’t be a problem. NOTE: Because you’re adding new information, GA will not transfer over details from the past, you will only see new results from when your join the two together. Now that you’re set up, it’s best to have a run down of what all the terms mean, so that you can understand your results better. AdSense Revenue is the amount of money you’ve made in your selected time period (2 weeks for me). / 1000 visits, is how much money you’ve made for every 1000 visits to your site. Ads clicked, is the amount of ads clicked by viewers. Ads clicked / visit, is the total number of visits, divided by the number of ads clicked. CTR stands for Click Through Rate and this is the percentage of clicks you get for each ad impression. eCPM stands for effective Cost Per 1000 impressions (M being a roman numeral). It’s the total earnings per 1000 impressions. AdSense Ads Viewed is the total number of ads seen, from all multiple ads on all the pageviews. 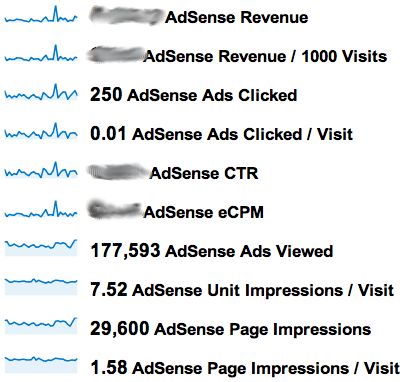 AdSense Unit Impressions / Visit is the number of ads that are viewed by visitors, per visit. AdSense Page Impressions is the amount of pages viewed that have AdSense ads on them. AdSense Page Impressions / Visit is similar to pages viewed per visit, only it’s pages with ads viewed, per visit. By far, my favourite thing about using Analytics to look at your AdSense, is that you can then find out which of your referrers are worth the most in terms of AdSense revenue. My results were rather shocking for me. For quite a while now, I’ve been featured on the homepage of a photography forum with about 7000 active members, but that’s grown a lot more over the last month or so. I don’t get a massive amount of traffic from them, as I currently only have 1 link on their homepage, but when I do, it’s worth a lot to me. Let me show you an example of what happened. When you go into the new GA, click on Content, then AdSense, then AdSense Referrers, this will bring up a list of all the websites that sent visitors who have clicked on an ad, as well as a timeline of your earnings. The results below are for a complete month, and unfortunately, due to Google’s rules and regulations, I’m not allowed to show you them, so you’ll just have to take my word for it. The most important part of the results isn’t the ads clicks, viewed, or even the revenue; it’s the Click Through Rate (CTR) and eCPM (effective Cost Per 1000 impressions). As we discovered earlier, the CTR is the percentage of ads that are clicked, per impression, so you want that to be as high as possible. The reason the CTR is much higher than some of the other referrers is because of the quality of visitor that I’m receiving from that referrer. StumbleUpon has a particularly poor CTR, because the people who use it aren’t looking for anything in particular so it’s hard to get their attention, which may result in them clicking on an ad. UglyHedgehog on the other hand is a forum for photographers, so the people on that site are actively looking for content in my niche. The eCPM is also substantially higher than the other referrers, which tells me that if I can increase the number of impressions that I’m getting from them, then I will earn a lot more money. The quality of Twitter user is usually pretty poor, as they don’t typically spend too much time on the site (00:01:47), and even though a link a lot to my website around 10 times a day through Twitter, I still get less traffic from them than Facebook. Facebook on the other hand has a better quality of visitor, with people looking at more pages and staying for longer (00:02:29, but their eCPM is actually lower than that of Twitter. 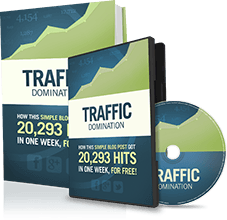 From these findings I can conclude that very high quality traffic, such as forums in your niche (uglyhedgehog.com has an average time on site of 00:04:09 and 2.19 pages per visit), will make you much more money, just so long as you can get the traffic you’re after. People are less likely to click on ads when they’ve come from websites such as Facebook, as they’re more interested in the content that you’ve written. They provide a good quality of visitor, but their time on site is almost half that of the forum in my niche, so it’s important to find a good balance of visitor quality. Twitter users seem to behave differently to other users, as they’re in a browsing mode, and are clicking on content that they see in their feed before it disappears. It would appear that they treat the websites they visit in a similar way, by clicking on more ads. I actually get more traffic from Facebook, but my earnings from Twitter far outweigh those of Facebook, which is good really, because it’s much more acceptable to post multiple links on Twitter. This step produced shockingly good results for my earnings. If you look have a look at my graph below, you’ll see that on the 6th of November, there was a massive increase in earnings. The first thing I did was look back to that day to see which post I had published, and I found a post titled ‘A Beginner’s Guide To Photography’, and this was simply a collection of my tutorials. This meant that anyone who had viewed the page would have to click on another if they wanted to learn anything. This forced them to increase their pages per visit, which produces more ad impressions. When I break down my earnings so that I’m only receiving information from the 6th of November, I can start to see which referrer is earning me the most money. T.co is the URL shortener that Twitter uses, so I can see clearly that a small number of page impressions has yielded very strong earnings. With a large number of clicks from 76 page impressions, I have an unusually high CTR. From this response, I can see that to earn money, this is the sort of content that I need to be promoting, though as many sources as I can. I’m currently combining this content, with the forum mentioned in the tip above, so that I can drive top quality traffic, to the content that earns me the most money. After just 2 days of doing this, I’m already starting to notice a massive improvement. Enabling your ad units to display both text and image/rich media ad types, increases the number of ads competing to appear on your site. More advertisers in the ad auction drives higher bids and more revenue for you. On average, publishers see a 59% increase in eCPM earnings when they make these recommended changes. If you’re not already using both, then it’s as simple as going into the ‘My ads’ tab, and clicking on ‘Edit ad type’, next to the ad in the list. This will increase the cost per click, so even if you’re not improving the number of clicks that your website is getting, you’ll still make more money. Advertisers prefer wider ad units for their premium inventory, resulting in higher bids for your ad placements. Though all sites are different, publishers typically see 0.35 eCPMs when using the wider ad size. You can start by simply changing single ads on popular pages to see how well they work, and if it’s not too intrusive, then you can start rolling it out across your whole website. I didn’t do this in my sidebar because I was aware that the whole width of the sidebar would have to change, and that would not only take a lot of time, but mess up the spacing that I had laid out for posts. Instead, I added a wider ad at the end of each post, that differs to all the other ads on my website, and this saw a good improvement in ad sales. Where you choose to place the ad on your site will make a big difference to the amount of clicks that you get, because the more obvious the ad, the more likely someone will be to see it. It’s hard to judge on your own website because we look at our sites differently to how other people view them, so the best way to start seeing results, is to experiment with ad placement. When I first started, I had two ads on my website, one at the top of the sidebar, and one at the bottom. Since then, we’ve added another ad to the side bar, and reloated the bottom one to under the subscribe button, added an ad to the bottom of each post, and put a small text ad just below our header. The small text ad below our header made the biggest difference to our results because it stands out the most to new visitors, and could even be possibly mistaken for a link within our own website. It’s a very simple ad, and less appealing than a flash one, but it’s much less intrusive, and in a better position. Overall, I don’t like to add too many ads because I don’t want to put off visitors or make my website look bad. I always find it odd when people choose to include an ad block in their header, because that makes me find their website much less appealing. thanks for super tips. I started monitizing my sites with google adsense and i have been testing different ways and have seen that by also making the ads same color as the color of you site increase my earnings. Another great post, Im new to google adsense so this post was a good place to start. Thanks for this great article with examples, but I think you are not suppose to reveal your click through percentage and some other data according to Adsense policies, you may want to check that out. Any specific tips for news site [updated 10+ times per day]? Very impressive information and you gave me some great ideas to incorporate into my Body By Chocolates project. Thanks for these valuable thoughts about making the most out of Adsense. Do you use Adsense mobile or search methods within your strategies? Great post Josh, I started using Adsence lately, not seeing great results yet, hopefully i will after reading this post. Other people have told me this as well: ad placement and size are everything. Great tips. Another tip is to always place a big square ad before the content for me that brings more money. but if you want to really make some extra money. I suggest you make your website mobile ready using a wordpress plugin which allows you to place a google banner. I dont know the exact name of plugin I use, I went blank. anyways, that alone brings me almost 30 bucks extra a month. Everyone uses there smart phones now indays to search online. Awesome, It’s a great post. Thank you for your sharing. Always wirh excelent posts Michael. I only have text in my site. Terrific clarity and logical progressions. Very helpful. Nice Josh, I run 9 websites and have tried integrating Adsense and Analytics a little while back, got one website (my main one) to work, but none of the others, I’ll be taking the time now to try and get all 9 working because I think with your tips, specially about the referrers, I’ll be able to concentrate my efforts. Very useful post about Adsense. I’m going to ponder all of these advises. I’ve done a lot of optimization of my Adsense on my blog, placements, posting high-paying niches, etc. I just want to share probbaly Adsense smart pricing has lot to do about the drop and increase of Adsense earnings. Very nicely written and easy to follow. 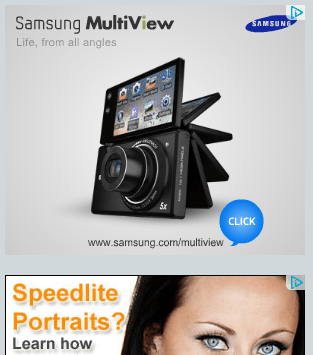 I am not using Ad-sense ads at the moment as I think I would be needed far more traffic before considering to use them. Also, If I manage to get into a reasonably decent paying position as far as the ads go, I would then feel it would be time to get back into Ad-sense. I did hear the same as you mentioned about how it is better to go with text /image ads. Also, when I did have my Adsense ads up, I noticed some really interesting stats between placement ads versus Contextual. Certain Placement ads did quite well, on given days(Higher eCPM) . thanks for the tips.I was looking around for this type of topic. Good article. I’m curious as to how many ads can you place on your site. I thought it was 3 ads that could be visible and one time? I do see some interesting topics on your site. Very nice tips. Thank you. I will try to apply your tips today. I’ll apply your tips in my blog. Thank you very much Josh !